I received an email from Professor Sunny Cai, who teaches architectural design at a college in Beijing , China. He mentioned his interest in ancient Chinese architecture, especially the earthen buildings called “tulou,” and he sent me some pictures of these rammed earth buildings. This picture was taken in front of a rammed earth building with Sunny Cai and his students. I did some further internet research and found out more about these interesting structures. 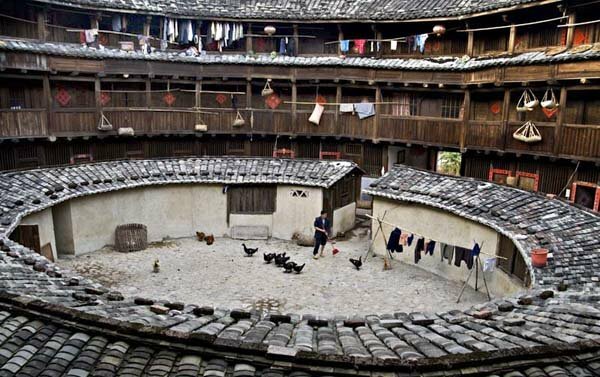 Tulou are traditional communal residences in the Fujian province of Southern China, often of a circular configuration surrounding a central shrine. Some of these vernacular structures were constructed of cut granite or had substantial walls of fired brick. The end result is a well lit, well-ventilated, windproof, earthquake resistant building that is warm in winter and cool in summer. There are more than 20,000 tulou in southern Fujian, and these were designated as a UNESCO World Heritage site in 2008 as “exceptional examples of a building tradition and function exemplifying a particular type of communal living and defensive organization, and, in terms of their harmonious relationship with their environment". Actually the Tulou were built by a minority called the Hakka, who were originally Han who fled south to escape war and famine during the Qin Dynasty (221-206 BC). As they gradually moved they changed the local architecture by incorporating Han styles and that produced the tulou. Not only were the high walls built for defense but they were also the result of traditional Han architecture. Tulou were mostly built between the 12th to the 20th centuries. The oldest one was constructed over 1,200 years ago and is regarded as a “living fossil” of the construction style of central China. There are three types of Tulou. The Wufeng has three halls and two side rooms and are said to be the result of a redesign of the Han courtyard. The oldest tulou are the rectangle ones, and the most emblematic ones are round. They are typically designed for defensive purposes and consist of one entrance and no windows at ground level. The biggest round one can have up to five stories with three interior rings. The largest houses cover over 40,000 m² and it is not unusual to find surviving houses of over 10,000 m². Most round tulous are three or four stories, with family kitchens and livestock on the ground floor. The next floor becomes a storage room for food and furniture (with no windows), and above that are the bedrooms. These structures are exemplary of sustainable architecture in that they are built of local, natural materials with simple techniques. They have good thermal attributes, with the massive earthen walls to help buffer temperatures. They are obviously built to last, and house many of the necessities for life. And they embody a communal life style that conserves energy and resources; these represent a form of ancient co-housing.